ALANTA, GA-Statistics don't come close to telling the whole story at the Georgia Aquarium in Atlanta, which stands as mankind's most reverent tribute yet to Earth's aquatic population. A half-million square foot facility situated on 9.5 acres of land; 100,000 animals representing 500 species; 8 million gallons of fresh and salt water; and 328 tons worth of acrylic spread out over 12,000 square feet of viewing windows. At the Georgia Aquarium entry plaza, a multipurpose space intended to host corporate events and musical acts as well as serving as the entry point for the facility is highlighted by a "wave wall" made of five stacked bands of Barrisol fabric where 75-foot long video presentations can be projected with Panasonic PT-D5500UL projectors, hung from the ceiling 40 feet high. The numbers on the AV? Eighteen months in the planning-with a considerably smaller time frame for execution-as integrator Electrosonic Systems made the very most out of its $2.5 million budget. 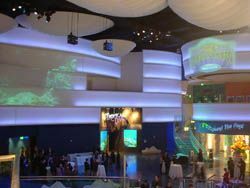 A complex install swimming in audio, video, paging, interactive, and show control elements for five galleries and a 4D theater, the Georgia Aquarium was a chance for the ambitious team at Electrosonic to charge forward into a project that many other AV firms dared not enter. "They had wild ideas for the projection systems which other contractors said couldn't be done, but we're used to doing innovative systems, so we didn't see it as a challenge," said Chris Conte, business development manager for Electrosonic. "We came in with very creative ideas to accomplish their goals, while still squeezing out as much bang for the buck as possible on the budget. Electrosonic has huge experience in very large integrated systems, and this was an ideal candidate: 1,000 speakers and five control rooms all linked together. There were some unique technology solutions we were able to solve successfully, so we really were ideal for the project." Although Electrosonic spent a good deal of time pitching and planning for the project, their green light to begin work came relatively late, coincidently when contractors were ready to install cable and pull conduit. At that point, the team, which was also helmed by project manager Dan Laspa and lead engineer David Schrider, took on the aquarium's three primary AV missions, which were to deliver maximum impact to its plaza, provide superior background music and paging, and support the 4D theater and five main themed galleries: Cold Water Quest, Georgia Explorer, Ocean Voyager, River Scout, and Tropical Diver. A multipurpose space intended to host corporate events and musical acts as well as serving as the entry point for the facility, the plaza is highlighted by a colorful, gorgeously mind-bending "wave wall" made of five stacked bands of Barrisol fabric where 75-foot long video presentations can be projected. "The wave wall was probably the biggest challenge of all the exhibits," said Conte. "We were the only contractor who said it could be done. Everyone else was gunshy for two reasons: First, it's difficult to project on a lit surface, and secondly, the wave wall isn't flat, so potentially it had a lot of field focus issues." In each of the spaces, Electrosonic looked for the right balance of performance and cost effectiveness. "We selected a number of Crown Amplifier products, primarily in the CTs range. We find them to be reasonably priced and very robust," Laspa said. "This project had a very tight budget so we had to be careful to use a mix of models to keep the costs down. We used a whole host of different speakers-our approach is to define what an area requires in a speaker and then go and find one that will do the job. "The main plaza area of the aquarium was the most challenging space, and we ended up using EAW speakers up high in three clusters and EAW under-balcony speakers down near the floor under some of the soffits. We used Electro-Voice EVID 4.2T speakers for the background audio in the galleries because they are a nice-sounding speaker, with very wide dispersion which suited the low ceilings in these areas. Bose ceiling speakers were used throughout the back of house paging areas for their quality versus low cost. For DSP, we went with the Peavey NION. On a project this size the cost-per-channel was reasonable and the software is extremely powerful." Throughout all of the galleries, each with separate control rooms linked via a highly efficient fiber network for streamlined control and monitoring, the points of interest in the AV infrastructure are far too numerous to list comprehensively. Highlights include the Georgia Explorer, where the wonders of offshore fauna like stingrays and sea stars are illuminated by four interactive kiosks featuring 19-inch ELO touchscreens, plus a realistic hurricane simulation storyteller station with the aforementioned Electro-Voice speakers and Tannoy 110CS subs. Meanwhile, Ocean Voyager's Open Ocean Touch Wall holds an impressive 6- by 18-foot display of six custom-built tempered glass screens butted together to form one continuous panel. Here, Epson PowerLite Cinema 200+ projectors display rear-projection video of animated fish, and a touch of the glass transforms the screens into touchscreens that trigger informative pop-ups. While the effort to accomplish the Georgia Aquarium's impressive AV underpinnings may have been fantastic, Chris Conte stressed that Electrosonic's objective is to make sure their efforts fit in with the main attractions, not overshadow them. "I think there has to be a balance with AV," he reflected. "It can be such a hostile assault on your senses, but the right way is to present it so it supports the emotion and the message. Everywhere you look in the Georgia Aquarium, there's appropriate media that reinforces the overall exhibits."